If you've decided to go to college in Maryland, you have to make a decision between two-year colleges and four-year schools. With over fifty institutions to pick from, you have to weigh the college's cost of tuition, reputation, major or trade specializations, grants, financial aid and scholarship offers. Fortunately, we have applied our rigorous methodology to the latest education data to rank the best colleges in Maryland, including the top four-year and two-year schools. According to the higher education commission, Maryland ranks fourth among the most highly educated states. Naturally you're going to want to get into the best four-year college possible. Many private schools get a reputation for being the most prestigious in the nation, but unfortunately are often the most expensive. For example, John Hopkins University ranks as the best college in Maryland and tenth in the nation, but the tuition comes to over $45,000 a year. Even if you have the grades to get into a school like JHU, most people can't afford the tuition and will be plagued with student loan debt after graduation. The good news is that public four-year colleges in the state are affordable and have good reputations as well. Maryland's public four-year colleges have tuition costs that roughly fall under $10,000. For example, University of Maryland--College Park has a 95% retention rate and a 84% graduation rate, with a tuition of just under $10,000. Their graduation rate ranks higher than almost all Maryland's private schools. Below you will find a mix of excellent public and private four-year schools in Maryland, ranked according to our proprietary formula. Over 800 students clubs, sports teams, and Greek life organizations offer just about every student at the University of Maryland, College Park a chance to get involved in their curricular or extracurricular interests. About half of UM students also participate in one of the college’s living and learning programs, in which students taking two or more courses together live in a shared environment and, under the oversight of faculty and resident hall directors, make the most of opportunities to connect curricular and residential experiences. With a choice of 90 programs across 11 colleges, UM offers the largest selection of majors of all Maryland colleges. A Letters and Sciences program is available to students who are admitted into UM but are awaiting approval from a limited enrollment program, such as business, journalism, or biochemistry. The school's wide selection of pre-professional programs include pre-veterinary medicine, pre-dentistry, and pre-physical therapy. These programs prepare students for the challenges of post-graduation advanced studies. UM offers daily and virtual visits to potential applicants, and an annual Maryland day features a campus-wide public open house with opportunities to speak with faculty and to attend student-led campus tours. Johns Hopkins University enrolls over 21,000 students in its world-renowned academic divisions. Particularly notable divisions include the Peabody Institute for Music, which offers a selection of degrees that include a bachelor’s in the business of music, and the Krieger School of Arts and Sciences, where students can earn a bachelor’s degree in neuroscience or in a wide array of other academic areas. A limited number of students are admitted each year to the school's double degree program, offered through the Peabody Conservatory in tandem with either the Krieger School or the Whiting School of Engineering. Johns Hopkins’s interactive and color-coded user interface makes it easy for students to find a degree that fits their interests and needs, whether full- or part-time, at one of the best colleges in Maryland. Students can choose from more than 400 clubs or organizations, including a Quidditch club, as well as 24 varsity sports teams and intramural or club sports. Johns Hopkins is recognized as a leading research university, ranked number one for its investment in medical, science, and engineering research by the National Science Foundation. Regularly listed among the top-ranking colleges in Maryland, the University of Maryland, Baltimore County offers 48 majors. Major offerings span a variety of disciplines, including the arts and sciences, engineering, pre-professional studies, and technology. UMBC also offers more uncommon bachelor's degree programs, like game development, medieval and early modern studies, and entrepreneurship and innovation. Additionally, UMBC offers a naval science ROTC program, preparing men and women for service as officers in the United State Navy or Marine Corps. Trailblazing students may create an interdisciplinary degree through the school's interdisciplinary studies program. Recently created programs include human-computer interaction and science journalism. UMBC enrolls over 11,000 undergraduate students annually at its Baltimore-based campus. The campus features university shuttle buses that run daily to sites throughout the city. Over 400 student athletes compete on 17 varsity teams in the NCAA Division I category. In addition to a thriving sports scene, UMBC is also home to two art galleries and a performing arts program with two theaters that showcase music, theater and dance performances all year. Towson University’s seven colleges, including an Honors College, provide a multitude of degree paths in liberal and fine arts, mathematics and the sciences, education, business and economics, and health professions. Students waiting for acceptance into a specific degree program or students interested in completing classes for personal or professional reasons may also enroll in Towson’s undergraduate non-degree program. Students accepted into Towson’s Honors College live together in the Honors residence hall and develop their talents through experiential learning opportunities, seminar-style classes, and co-curricular programs that offer interdisciplinary research and project experiences. As one of the best colleges in Maryland, Towson offers a wealth of opportunities for student involvement, including over 200 student groups, fraternities and sororities, NCAA Division I athletic teams, student government, community and political service and leadership initiatives, and more. Towson is the second-largest university in the University System of Maryland and is recognized by the Carnegie Foundation as a leading institution in curricular engagement and outreach. St. John’s College offers a unique BA in Liberal Arts to all students, with a liberal arts and interdisciplinary curriculum delivered in a completely seminar-style format that sets it apart from other Maryland colleges. At St. John's, students take courses that cover the breadth of a classic liberal arts education, including topics in philosophy, mathematics, political science, literature, and more. Academic focus is placed on developing skills that equip students to be forward-thinking leaders and problem-solvers in any field, including those yet to be created. All students complete four years of language, as well as two years of music study, an integral part of the St. John’s College experience. Juniors and seniors participate in preceptorials, providing in-depth study and discussion of a specific written work, such as Plato’s “Republic” or Gabriel García Márquez’s “One Hundred Years of Solitude”. St. John’s Maryland campus was founded in 1784 in scenic Annapolis. The campus features six historic and two modern dorm houses, colonial style decor, and an abundance of gardens and benches..
Washington College is a historic small liberal arts institution in Chestertown, Maryland. Small class sizes and a choice of more than 40 programs make this one of the most ideal colleges in Maryland for students seeking a personal experience in a celebrated and storied environment. The 10th-oldest college in the United States, Washington College’s academic and experiential centers include the Center for Environment and Study, which offers internships and fellowships with environmental organizations, and the C.V. Starr Center for the Study of the American Experience, focused on providing innovative programs and fellowships that bring history to life and promote scholarship and public engagement. Washington College is also home to 17 men’s and women’s varsity sports teams, including tennis, rowing, and swimming. The college’s Casey Swim Center and Johnson Fitness Center, which features racquetball and squash courts, are open to all students. Each month, Washington College hosts a line up of innovative speakers, lecturers, and arts and science events, from female senators in Washington speaking in celebration of the 19th amendment to visiting scientists discussing cosmochemistry. Students at Salisbury University choose from 42 BA, BS, or BFA degrees, as well as a Bachelor’s of Social Work degree. Students at SU may also choose from another 65 optional minors. Unique program options include degrees in conflict analysis and dispute resolution, English for speakers of other languages, and information and decision sciences. As one of several “green” Maryland colleges, SU pioneers an array of sustainability initiatives. These initiatives are woven into the fabric of the campus: for example, four university buildings (and counting) employ geothermal heating and cooling, commuters enjoy access to electric vehicle charging stations, and students have access to three on-campus gardens (operated by students and faculty). Students interested in a “green” major may choose a dual degree in biology and environmental science, offered in partnership with the Department of Natural Sciences at the University of Maryland Eastern Shore (UMES). SU encourages all students to complete internships. Loyola University is widely recognized as one of the best colleges in Maryland, with courses and programs offered through its three schools: the School of Arts and Sciences, the School of Education, and the Sellinger School of Business and Management. The heart of all of its undergraduate degrees, Loyola’s core curriculum includes courses in literature, mathematics, theology, ethics, and other liberal arts-based fields. A diverse set of majors includes innovative options like quantitative economics, speech-language-hearing sciences, and digital media and communication. Loyola also offers three pre-professional programs and combined bachelor/master programs in either education or, in partnership with Columbia University, a physics and engineering degree. Messina, Loyola’s program for first-year students, includes living and learning with a small cohort of peers and completing themed courses like “Stories We Tell” and “The Good Life”. Loyola also offers a unique Baltimore Student Exchange Program, which allows students the opportunity to take courses at other participating Baltimore-based institutions, including Johns Hopkins and Towson University. One of few Maryland colleges that specializes in arts education, Maryland Institute College of Art’s selection of focused fine arts programs provide students with the opportunity to realize their full artistic potential. Integrating knowledge across subjects and experimenting with a variety of approaches, all of the school's undergraduate major programs include the option to add a studio concentration, such as sound art or experimental fashion, or a liberal arts minor like gender studies or culture and politics. Example majors include architectural design, fiber, illustration, and printmaking. MICA also offers a dual bachelor’s option and a master’s degree in art education. Student, faculty, and other artists’ work are displayed throughout the campus on a continual basis via multiple on-campus exhibitions. MICA also hosts speakers and lecturers in the arts throughout the year. The school offers a comprehensive set of academic services and resources (including career development services focused on art and design), professional development for emerging artists and scholars (with workshops geared toward maintaining work and life balance), and the Decker Library, which features a vast collection of visual arts resources. St. Mary’s College of Maryland’s 30 major and minor programs allow students to explore career opportunities in all areas of society, from anthropology to democracy studies to computer science. Most seniors complete a capstone research or creative arts project that may be major-focused or multi-disciplinary. St. Mary’s was founded in 1840 on the St. Mary’s River, about 90 miles south of Baltimore. Today the school is recognized as Maryland’s public honors college, one of only two honors colleges nationwide. The school has one of the smallest student populations amongst colleges in Maryland: about 1,900 students. This small roster allows St. Mary's to provide a very rare 10-to-1 student-to-faculty ratio and yields a highly personalized classroom environment. St. Mary’s faculty and alumni have been awarded 55 Fulbrights over the past 34 years, a reflection of the school's scholars’ and professionals’ commitment to furthering their field of study and expertise. St. Mary’s offers both study abroad and international internships throughout Europe, Asia, and the Americas. A select number of study abroad scholarships are also awarded based on academic and merit. The University of Baltimore's undergraduate degree programs are designed to accommodate a wide range of student schedules: the school offers with day, evening, and weekend classes. UB’s flexibility combined with its innovative degree offerings secure its place as one of the best colleges in Maryland. Many of UB's unusual degrees are not offered elsewhere: stand-out options include bachelor’s degrees in community studies and civic engagement, simulation and digital entertainment, or jurisprudence. Additionally, UB offers students a unique Entrepreneurship Fellows program, which provides full scholarships to students as they take classes and build their business. Students will find over 90 student organizations and ongoing activities and events through the school's Rosenberg Center for Student Involvement. Women looking to develop their leadership skills will find networking and resources through the Women’s Initiative for Leadership Development, while a 6-week Habitudes Leadership Series is open to all students. UB faculty are recognized experts in their field, with 78 percent holding the highest degree in their domain. In addition to welcoming new students, UB’s undergraduate programs are targeted towards career changers, first-generation students, and professional adults. Founded in 1865, students at Bowie State University choose among 22 undergraduate programs across the fields of arts and sciences, business, and technology. Students with an interest in science might choose a degree in bioinformatics or forensic science, while others who crave the spotlight and working with people may be drawn to broadcast journalism or the theater arts. Students interested in exploring and building their strengths have the opportunity to join the Scholar's Studio, a series of two to four courses that follow a common theme and provide mentoring and experiential opportunities in and out of the classroom. Other support services can be found in Bowie's Academic Advisement centers, which offers individual and small-group tutoring, a TRIO Achievers program for first-generation college students, and disability support services. Bowie State is one of the best colleges in Maryland and the longest-running historically black college in Maryland. Today the school continues its efforts to provide the best educational opportunities for underrepresented student populations from all over the country. Students at Washington Adventist University can choose from BA and BS degrees in a variety of fields. Program choices include broadcast journalism, metropolitan ministry, and medical laboratory science. Students can also choose a Bachelor of Music degree in performance or education. A select group of WAU minors, including languages and a number of business domains, also provide students the opportunity to complete a residency at an overseas campus through the Adventist Colleges Abroad program (ACA). WAU offers a number of special programs and associations, including an honors program that provides motivated learners with the chance to join like-minded students in a rigorous learning community. WAU’s music program is one of the best among colleges in Maryland, with many of its groups—including the Brass Quintet and the Collegiate Chorale—performing at Carnegie Hall and other domestic and overseas locations. Originally founded in 1904 as a co-educational training school in the liberal arts, WAU now operates under the Seventh-day Adventist Church and offers on-campus chapel, off-campus mission programs, and a spiritually-focused diversity program. At Frostburg State University, students choose from 44 undergraduate programs, with unusual options like adventure sports management and ethnobotany offered alongside a variety of professional and liberal arts and science degree choices. Students who are regional residents (defined as students whose hometowns are within 120 miles of Frostburg State) receive discounted tuition rates, a unique offering amongst other colleges in Maryland. FSU is home to 21 varsity sports teams, including men’s and women’s basketball, lacrosse, cross country, soccer, and many more, all of which compete at the NCAA Division III level. Students looking for ways to finance their education can apply for FSU-sponsored grants and institutional and departmental scholarships. Qualifying students benefit from several on-campus state and federal work study opportunities. FSU offers a diverse range of events year-round--from academic seminars to project displays to creative performances--many of which are hosted or performed by students. Mount St. Mary’s University offers a rigorous academic experience focused on leadership development and rooted in Catholic tradition. All programs include full integration of the school's liberal arts core curriculum and students choose from a wide range of major and minor degree options in the arts, sciences, and business. Interdisciplinary majors allow students to work with faculty in designing their own major program. The university's renowned honors program opens doors to working with faculty across schools on interdisciplinary research and creative arts projects, as well as participating in service-learning trips, and more. Alumni at one of the top-ranked colleges in Maryland have gone on to work in management and executive roles for companies like McKinsey and Company, Wells Fargo, and Under Armour. Many have also realized their entrepreneurial endeavors and started companies and venture investing firms of their own. Mount St. Mary’s annual two-day SPARC festival, which honors the academic and artistic achievements of its students, includes student “lightning” talks, an art exhibition, a keynote speaker, live performances, and more. Founded in 1867, McDaniel College is a liberal arts and professional studies school. The college's campus is located in Westminster, about an hour outside of Baltimore and Washington D.C.
MD offers multiple majors across its 24 academic departments, ranging from environmental studies to military science to world languages, literatures, and cultures. McDaniel is also one of few Maryland colleges to offer a selection of five-year BA/MS programs, including gerontology, music education, and human services management. Students may also choose to pursue one of a handful of pre-professional programs, such as pre-medical or pre-law. Special programs at the school include the Encompass Distinction, a unique opportunity designed for budding entrepreneurs. Students in this program complete field experiences, specific courses, and public showcases, as they work toward building their own organization. Notably, the school operates a study abroad center and campus in Budapest, Hungary. McDaniel also offers study abroad tours in hundreds of cities throughout the world, as well as student exchange programs in Belgium or Zimbabwe. Coppin State University provides a broad range of academic and professional degree choices across four colleges and six schools, including arts and sciences, education, allied health and nursing programs, behavioral and social sciences, and business. Among Maryland colleges, CSU places a particular emphasis on its students’ first year experience: the school provides freshman seminars, placement testing, ongoing advisement, and plenty of opportunities for new students to participate in campus events, student organizations, and club sports. The school's First Year Experience Student Steering Committee includes peer mentors dedicated to providing support and guidance services to students. Students can also opt to participate in CSU's unique Laptop Program, which allows students to pay an affordable fee for a laptop computer over each semester, with the option of paying a nominal price to own the laptop at the close of their senior year. 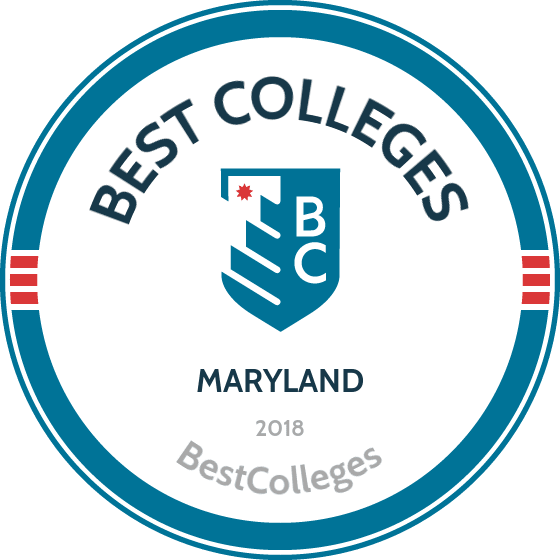 Last on this list--yet not least amongst the best colleges in Maryland--Hood College, a coeducational, independent, liberal arts college, offers bachelor's, master's and doctoral degrees, as well as post-baccalaureate certificates. Home to approximately 1,200 undergraduate students, Hood offers more than 30 majors, 50 minors and pre-professional preparation in medicine, veterinary science, pharmacy, dentistry and law. Hood students experience small class sizes, where they receive individual attention from supportive faculty. With its proximity to Washington, D.C., Baltimore and the I-270 biotech corridor, students have access to countless internships and research opportunities. For high-achieving students, Hood offers a four-year honors program with a living and learning setting expanding the curriculum with an emphasis on interdisciplinary education through discussion-based seminars, collaborative projects and experiential learning opportunities. Hood is located in a fantastic college town; students are within walking distance of shops, galleries and restaurants and a vibrant downtown. A tremendous alumni network offers students and graduates mentoring, connections, guidance and advice. Notre Dame of Maryland University is home to an undergraduate Women’s College and the school's College of Adult Undergraduate studies, both of which offer a select set of degree completion programs. The Women’s College is the only one of its kind amongst all Maryland Colleges, and offers 26 degree paths ranging from art to behavioral neuroscience to international business. Notre Dame was also the first Catholic college in the U.S. to award a four-year degree to a woman. Students interested in academic challenge and personal growth might consider applying to one of several special programs offered by the school, including an honor’s program, a Transformational Leaders program, or First Impressions, a program that pairs juniors and seniors with alumni mentors to help prepare them to enter the workforce. At Notre Dame, students may join an existing organization, such as the Society of Women Engineers, or work with student government to start a new organization. Notre Dame’s wooded campus is located in the city Baltimore, with easy access via a free college shuttle to local sites, including Penn Station. University of Maryland Eastern Shore is a historically-black college that has undergone several changes in name and governing bodies since its founding in 1886. In 1988, the university became one of what is now 13 Maryland colleges in the University of Maryland network. Its location in the small shoreside town of Princess Anne features many historic sites and is only an hour’s drive from Ocean City and three hours from Baltimore. UMES offers BA and BS degrees in a variety of fields, including several rare programs. Examples include a bachelor’s in human ecology with an emphasis in nutrition or fashion merchandising, or a degree in aviation science specializing in piloting or aviation software. UMES students in almost all academic fields have access to a wide range of experiential learning opportunities, many of which are on-campus, including hotel restaurant management events held throughout the year, and an engineering virtual reality lab. Stevenson University's 15-to-1 student-to-faculty ratio allows for small class sizes and personal interactions between professors and students. SU students choose from a range of innovative programs, including visual communication design, biochemistry, and fashion design. Stevenson faculty works with each student to design a Career Architecture Plan. These plans, unique to SU, prepare students for careers in post-graduation management and are the only of their kind offered among colleges in Maryland. Stevenson’s Career Architecture Model was awarded the Maryland Career Development Association (MCDA) Organizational Career Planning Award in 2013, and a recent survey of graduates found 93% had found a full-time job, were attending graduate school, or were serving in a volunteer role or in the military. Most undergraduate programs require a minimum of one internship or field placement, allowing students to gain hands-on experience and explore career options. Stevenson is an independent university, enrolling over 4,000 students every year in seven schools across its two campuses (Baltimore and Owings Mills). Goucher College offers a student-faculty ratio of 11-to-1, resulting in small class sizes that allow for more individual attention and opportunities to collaborate with peers. Goucher puts a focus on 21st century skill development—including relationship building, resilience, and reflection—and equips graduates with the skills necessary to adapt to a rapidly evolving workforce. About 95% of Goucher students participate in some form of hands-on learning, whether it be an internship, research, or community service. Goucher’s diverse population includes students with a range of cultural and ethnic backgrounds, stemming from 44 states and six countries. One of the only Maryland colleges with a study abroad requirement, all students travel and study via one of Goucher’s 65 programs offered in 35 countries. Bachelor’s degree programs span the arts and sciences and include unique degrees such as historic preservation, equine studies, and American studies. All students follow the Goucher Commons liberal arts curriculum, which builds upon foundational skills each year and ends with a reflection portfolio or capstone experience. The University of Maryland’s University College, one of the best colleges in Maryland, offers over 30 bachelor’s degrees including fields such as communication, the natural and health sciences, business, and technology. Students will find professional options like accounting and legal studies, as well as less common options such as investigative forensics or gerontology and aging services. A flexible transfer credit policy allows students to transfer up to 70 credits from accredited two-year programs and up to 90 credits from four-year programs. Maryland community college students are also eligible to earn one of UMUC’s Completion Scholarships. UMUC is an ideal option for both new and nontraditional students, offering multiple start dates per semester to accommodate a wide range of schedules, as well as classes at more than 20 locations in Maryland, Washington D.C., and Virginia. UMUC is consistently recognized as a military-friendly school, offering up to 100% tuition coverage for undergraduate military members. Capitol Technology University stands alone among Maryland colleges in offering a one-of-a-kind guarantee: job placement in a related program field 90 days after graduation. Students who make an effort but don’t find a job are given the opportunity to complete up to 36 free additional credits while they continue their job search. CTU also provides all newly-admitted students with a Right START Planning Day before their first semester, offering placement and advising services. CTU's BS degrees are geared towards students interested in high-tech or business fields, with stand-out programs like astronautical engineering or mobile computing and game programming. CTU is a long-standing Yellow Ribbon member, offering Maryland National Guard members up to a 50% tuition discount. Students at CTU are eligible for a number of institutional scholarships, both merit- and needs-based. Each year, CTU awards a full four-year scholarship to five outstanding incoming freshmen students. The school is located in the suburban Laurel neighborhood, about halfway between Baltimore and Washington D.C.
A historically black institution located in suburban Baltimore, Morgan State University is a founding member of the Mid-Eastern Athletic Conference. MSU stands out among colleges in Maryland for program offerings that meld the traditional and innovative, ranging from English and mathematics to screenwriting and transportation systems. About 35% of its 7,700 and growing student body hail from out-of-state. Morgan’s undergraduate programs are particularly geared toward students in the arts and sciences, though it also offers programs in technical and professional fields like engineering, education, and architecture. Morgan State recently announced its decision to join a coalition of historically black colleges and universities that have signed an agreement with the United States Department of Energy. This is part of an effort to build and leverage STEM talent to ultimately bring solar energy resources to underrepresented communities throughout the United States. At a two-year college in Maryland, you can earn an associate degree, a certificate for a specific skill or trade or eventually transfer to a four-year college. Having an associate or bachelor's degree can dramatically improve your chances of employment. According to Maryland's Economic and Labor Market Analysis for 2013, 6% of the state's educated citizens hold an associate degree and 20% hold a bachelor's or higher. Those with an associate or bachelor's degree make up 23% and 27% of the workforce in Maryland, respectively. In deciding what two year college to go to, it is important to learn which yield the highest employment and transfer rates upon graduation. Many two-year colleges have transfer agreements with four-year colleges, giving you a better chance to get in if you follow the conditions. Staying away from colleges with low retention rates should factor into your decision. CCC, located in Westminster, offers over seven academic fields, making it one of the best two-year colleges in Maryland. Popular courses of study at Carroll include business, nursing, physical therapy, and emergency medical services. Students interested in an academically rigorous experience at CCC can apply to the Hill Scholars Honors Program. Hill Scholars take themed seminar classes with fellow honors students and receive special transfer planning from dedicated honors advisors. Students interested in a degree focused on math, science, engineering, or technology may be eligible for CCC’s STEM Honors Program. Here, students have access to one-on-one academic advising, a faculty mentor, and professional development opportunities. To support students through their first year of college, CCC has developed a “Your First Year” Program. Students in the program have opportunities to invite family and friends to campus, have sponsored lunches with faculty members, and attend welcome celebrations hosted by student organizations. HCC, located in Bel Air, provides students with 65 programs across seven different academic divisions. This includes degree and certificate courses. A core part of Harford’s mission is to equip students with the skills they need to thrive in a global economy. The school provides students with a variety of multicultural opportunities, including study abroad programs and partnerships with other academic institutions in and outside of the United States. HCC, one of the best community colleges in Maryland, has an honors program. The program features small class sizes capped at 15 students, honors scholarship opportunities, and the chance to transfer to the Honors College at Towson University with a $1,000 scholarship. HCC’s partnership with Towson affords non-honors students the opportunity to earn a bachelor’s degree in one of eight compatible programs by transferring to the school’s nearby northeastern Maryland campus. FCC serves approximately 16,000 students every year at its Frederick, campus. FCC offers more than 85 degree and certificate programs, surpassing many other community colleges in Maryland. Uncommon programs at Frederick include cybersecurity, theatre, and tourism and hospitality management. The school’s vibrant arts scene is powered by FCC’s Arts Center. The Arts Center oversees two campus theaters and the Mary Condon Hodgson Art Gallery, which presents 10 exhibitions annually. The theaters host lectures, performances, exhibitions, and educational programs. Frederick has an accredited child care center on campus with discounts for students. The school’s athletics program also offers students the opportunity to participate in eight intercollegiate sports, including baseball, basketball, and soccer. The golf program at Frederick is popular; each year, the school hosts the FCC Foundation Golf Tourney. The school’s veteran services help military members interpret VA regulations, provide academic planning and advising, and personal counseling. Chesapeake, founded as Maryland’s first regional community college in 1965, offers more than 70 majors to students from the communities of the Eastern Shore. Chesapeake’s academic programs include liberal arts degrees and career and professional studies. One of the school’s newest degrees is an agriculture AAS program, which prepares students for careers in farm management and ownership. Other popular programs at Chesapeake include sports management, phlebotomy, and teaching. The school’s Success and Interactive Learning program offers an affordable two-year education. Students who successfully complete the program may be eligible for stipends during their second semester. Like other Maryland community colleges, Chesapeake runs an on-campus childcare center for use by students and faculty. Chesapeake also provides students with mental health services, including crisis intervention, medicine management, and counseling and psychotherapy. The school has athletic programs in baseball, softball, basketball, volleyball, and soccer. Many of Montgomery’s students study in-demand fields like nursing, biotechnology, and teaching. The school helps nearly 5,000 students transfer to four-year colleges annually. Unlike other community colleges in Maryland, the school has three campuses throughout Montgomery County and provides shuttle service to students between campuses. Evening, weekend, and online classes give students greater flexibility in scheduling courses. Popular degree programs include building and construction technology, communication studies, teacher education, and general studies. MC also offers students the opportunity to participate in more than 130 student organizations, nurturing a vibrant campus community. The school boasts small class sizes and low student-to-faculty ratios, providing more personalized attention to students. The school enrolls over 60,000 students across its three campuses. School athletic teams include baseball, softball, track and field, and soccer. Clubs and organizations include Adventure Club, Anime Society, Bhangra Dance Club, and Photography Club. Located in Columbia, Howard serves 30,000 students each year. The student body represents more than 100 countries. The school is located in one of the most well-educated areas in the country. HCC offers career and transfer associate degrees in a variety of subjects, including actuarial science, Asian studies, biomedical engineering technology, and cybersecurity. Howard sets itself apart from other two-year colleges in Maryland with its approach to higher education. Through the Center for Service Learning, students can earn credit in courses that combine volunteer service, self reflection, and academic instruction. HCC offers a number of study abroad programs in France, China, Bermuda, and Denmark. High-achieving students can apply for membership in one of several honors programs at HCC, including the Schoenbrodt Scholars Program. Students in this elite program have access to special seminars, events, and research and scholarship opportunities. Anne Arundel, located in Arnold, is one of the largest community colleges in Maryland, serving approximately 50,000 students each year. Students can choose from more than 225 programs and 3,500 courses. Over 70% of Anne Arundel County public school students start their higher education journeys at the school. AACC is committed to helping students finance their educations, and the school regularly offers workshops on completing the FAFSA application and finding ways to pay for college. The school also values and promotes diversity on campus, with more than a third of ACC’s credit-seeking students identifying themselves as members of a minority ethnicity. ACC’s commitment to diversity is also evident in the awards and accolades bestowed upon its faculty: the chair of the math department, Alycia A. Marshall, was recently named to INSIGHT into Diversity’s list of 100 Inspiring Women in STEM. Hagerstown, founded in 1946, is Maryland’s first community college. At its 319-acre campus, students can pursue more than 100 programs of study. HCC’s commitment to improving on-campus amenities and student life puts it among the top two-year colleges in Maryland. Through a $15-million investment, the recently expanded student center now offers students the chance to connect with one another in private meeting rooms, study lounges, and on a 10,000-square-foot outdoor patio. Hagerstown is committed to making higher education affordable for its students; 75% of HCC students receive assistance through financial aid or scholarships. Veterans and military personnel are eligible for additional financial aid and benefits at Hagerstown, coordinated through a school veterans representative. Veterans can also seek additional support at HCC’s on-campus Veterans Connection Center. One of HCC’s most popular programs is its nursing degree. Nursing students have special access to the school’s Nursing Simulation Lab, where they can practice nursing skills with patient mannequins. Garrett’s 62-acre main-campus sits near Deep Creek Lake in western Maryland, surrounded by forests, farms, and rivers. The school’s rural location fuels its program offerings, including its AAS programs in adventure sports management and natural resources and wildlife technology. Students at Garrett are also able to pursue more traditional offerings in fields like business, teacher education, and the liberal arts and sciences. The school has a student-to-faculty ratio of 13:1, and 94% of students receive financial aid. Students benefit from Garrett’s academic resources and support services, including small class sizes and tutoring centers for math, science, and writing. Online courses are taught through the Blackboard Learning Management System. Garrett is among the community colleges in Maryland that offers athletic programs, including baseball, basketball, softball, golf, and volleyball. The Garrett Information Enterprise Center offers office space to entrepreneurs who are just starting their business. In 2013 the school had an average GPA of 3.0. CSM, one of the best community colleges in Maryland, has four campuses in the tri-county area. The school was founded in 1958 and offers more than 100 academic programs, including 24 fully online degrees. It’s the sixth largest community college in Maryland, with over 24,000 students. CSM’s students benefit from the school’s transfer agreements with more than 50 universities, including nearby institutions like the University of Maryland, Towson, George Mason, and the University of Maryland School of Nursing. CSM prides itself on its high academic standards, and 90% of its full-time faculty hold a master’s or doctorate degree in their fields. CSM is committed to making higher education attainable for veterans and military personnel. The school is distinguished as a military-friendly institution by the Military Advanced Education Guide. CSM provides veterans with robust resources like an on-campus veterans lounge, special job search tools, and Veterans Affairs advisors. Wor-Wic serves more than 10,000 students from Worcester, Wicomico, and Somerset counties. WWCC is a good fit for students in search of community colleges in Maryland that help them earn their degree quickly. Students can take courses online, on weekends, and in the evening. Wor-Wic provides eight-week, back-to-back courses, allowing students to accelerate their academic careers. The school offers 20 for-credit degree programs. WWCC’s program offerings include turf management, construction engineering technology, and chemical dependency counseling. According to the school, more than half of local college-bound high school graduates attending Maryland colleges started at WWCC. Wor-Wic focuses on affordability, as its tuition is 60 percent less than the average four-year Maryland college. The school offers a host of online resources and in-person loan seminars to help students plan how to pay for their education. Baltimore City, located next to Hanlon Park, was founded in 1947 as Baltimore Junior College. The school offers 29 associate degrees and 16 certificate programs to students looking to further their education and career. BCCC is home to one of the nation’s oldest community college biotechnology training programs. Through the school’s Life Sciences Institute, students receive in-depth training in biomedical and health sciences fields, leading to in-demand careers in science and technology. Students who earn a biotechnology degree through the Life Sciences Institute participate in a capstone course, requiring them to complete a 250-hour research internship, which helps connect them to top employers in the area. BCCC is one of the few community colleges in Maryland that operates an English language & basic skills department. This department gives non-native speakers the skills they need to succeed academically, find a job, and even earn citizenship. CC, founded in 1968, aims to provide a learner-centered education to students in Cecil County. The college offers more than 60 degrees and certificates and boasts a student-to faculty ration of 18:1. Programs include equine studies, political science, ocean studies, and horticulture. Cecil distinguishes itself from other community colleges in Maryland with its Accelerated Studies for Adult Professionals (ASAP) program. Here, working adults can earn their associate degree in 17 months through the program’s nine-week-long session format. The school offers courses during the fall, spring, and summer, and during a condensed January intersession, giving all students flexibility in earning their degrees. Cecil athletics include baseball, basketball, golf, and soccer. Clubs and organizations include Alpha Alpha Theta (the school’s honors society), Horticulture Club, Seahawk Cheerleaders, and Student Veterans Organization. Student services include a math and computer lab, advising, and tutoring. Prince George’s serves more than 44,000 students from 103 countries around the world. The school teaches courses through a global perspective and offers more than 200 programs. PGCC’s for-credit academic programs fall under five divisions: liberal arts, health sciences, social sciences and business, learning foundations, and STEM. Prince George’s supports students through tutoring and mentoring opportunities, academic advising, and behavioral intervention. PGCC also offers a special entrepreneurship program unique among two-year colleges in Maryland. Open to PGCC students who transfer to the University of Maryland, the Hillman Entrepreneurs Program trains students to successfully run their own businesses while providing a scholarship that covers more than 60% of tuition and books. Students can get involved on campus by participating in one of Prince George’s 12 intercollegiate sports programs or its student-run clubs and organizations. CCBC, one of the largest and most innovative community colleges in Maryland, serves more than 65,000 students annually. It has partnered with more than 100 regional employers to deliver cutting-edge employee development programs. CCBC offers more associate degrees and certificate programs than any other institution in the region. Students can choose from more than 200 programs of study, with degrees in aviation management, anthropology, and radiation therapy. CCBC encourages its students to get involved in the campus and local community. The school’s Student Ambassadors program equips learners with the leadership skills needed to represent the school and serve the larger Baltimore community in a variety of ways. CCBC promotes the arts, with an art gallery on three of its campuses and many opportunities to get involved in, or attend, theater and music performances. If you're thinking about applying to one of the best colleges in Maryland, continuing reading to learn more about living in the Old Line State. Maryland is the eighth smallest state in the U.S., but is rich with landscape and history. It is considered the first state to adopt religious freedom. One of the most highly educated states in the U.S., it has the best median household income. On the coastal regions, it can be very humid and hot in the summer, and the winters are mild compared to the harsher winters in Western Maryland. Part of the eastern side of Maryland borders the Delmarva Peninsula, where agriculture and fishing contribute to the economy. Maryland is also home to a host of famous attractions: Fort McHenry, the National Aquarium and the Walter Art Museum. For more details, please see the Board of Regents' official policy statement.